Good for picnics, a side dish, or part of a school lunch, cold pasta salad recipes are easy to make and sure fire crowd pleasers. Cold pasta salad recipes can be a refreshing meal and can be made with whatever pasta you happen to have on hand. You could add pasta to pretty much any salad you like. Some cold pasta salad recipes use conchiglie (little shells) and some use egg noodles, but you can use the pasta you like to make your salad. Let the pasta cool in your refrigerator. Toast the walnuts in your oven at 350 degrees for five minutes. Whisk together the oils and vinegar in a bowl. Arrange the greens in a large bowl. Scatter the pasta over the greens. Toss the toasted walnuts over the pasta. Cold pasta salad recipes can use Asian noodles and flavors like this one. Toss the noodles with sesame oil. Using a vegetable peeler, shave the carrot into thin ribbons. Blanch the carrot ribbons and the bean sprouts in boiling water. Shock the beans and carrots in ice water. Drain the bean sprouts and carrots well. Using the vegetable peeler, shave thin ribbons of the cucumber. Place the bean sprouts, carrots, cucumbers, scallions, and turkey in a large bowl. Add the noodles to the bowl and toss to mix. Garnish the salad with the peanuts and basil. I like to use fusilli for this salad. Fusilli is spiral-shaped pasta that can be found in rainbow colors, which will add a colorful touch to your salad. Cook the fusilli according to the package directions. Let the pasta cool in the refrigerator. Preheat your broiler to a medium heat. Place the chili, tomato halves, and bell peppers skin side up on a cookie sheet. Place the cookie sheet into the broiler and cook until the skins are well-charred, turning occasionally. Once the peppers are charred, place them in a bowl and cover with plastic wrap. Peel the skin from the peppers and slice the flesh into strips. Place the ground almonds on the cookie sheet and toast in the broiler for about three minutes until golden brown. Using a food processor, blend the bell peppers, chili, garlic, and tomatoes until pureed. While the food processor is still running, slowly drizzle the oil through the feeder tube to form an emulsion. Place the mixture into a saucepan and fold the almonds into the mixture. Warm the sauce until it is thoroughly warmed. Place the cooled pasta in a serving bowl. This creamy pasta salad can serve as a side dish, but it also makes a great main dish for lunch. Boil pasta according to package directions; rinse with cold water and drain pasta well. Thaw peas completely; drain well. Combine cooled pasta, peas, carrots, onion and tuna in a large bowl; mix well. Combine mayonnaise, lemon juice, sugar, dill weed, salt and pepper in a smaller bowl; blend well. Pour mayonnaise dressing over macaroni mixture; toss lightly. Refrigerate for 2 hours or until thoroughly chilled. Sprinkle with paprika, if desired, and serve on lettuce leaves. 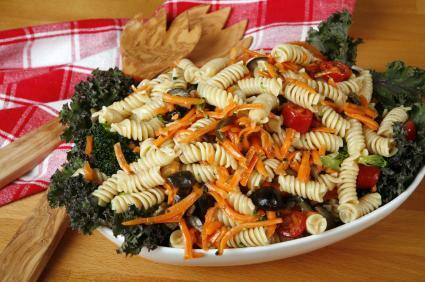 Cold pasta salads make excellent side dishes for a warm day, or any time you need a make-ahead recipe. Try one of the recipes above, or give cold chicken pasta salad a try for your next meal or potluck.